Maidenhead, UK. 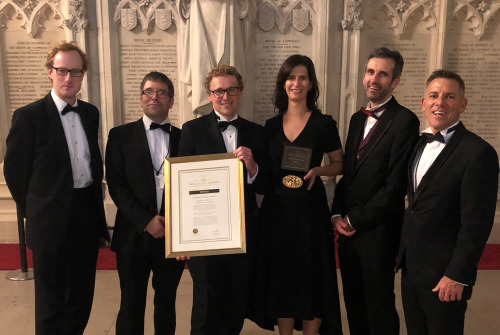 – 16 November, 2018 – Biogen was announced as the winner of the Orphan Product Award at last night’s UK Prix Galien 2018, for Spinraza®, which in 2017 became the first and only approved treatment for 5q spinal muscular atrophy (SMA). This is further recognition of the innovative science behind the development of nusinersen, which has already won five Prix Galien awards in the U.S, Italy, the Netherlands, Belgium-Luxembourg and Germany. In addition, the scientists behind nusinersen won the Breakthrough Prize, which honours transformative advances toward understanding living systems and extending human life, earlier this month. Prix Galien was introduced to recognise innovative and important medicines. The awards are judged by prominent healthcare leaders, academics and specialists. It is one of life science’s most prestigious awards for innovation, recognising breakthrough therapies which improve the human condition and address unmet need. The ceremony was held at the House of Commons, London on 15th November 2018, where nusinersen won by unaminous decision, having been one of seven finalists in the Orphan Product category. SMA occurs when a person has mutations or deletions in the Survival Motor Neuron 1 (SMN1) gene, causing issues with nerve functionality. We all have a backup of this gene, called SMN2, however it does not produce enough SMN protein on its own. Nusinersen works by increasing the amount of full-length SMN protein,5 with the potential to fundamentally change the course of the disease in individuals with SMA.